Wait! 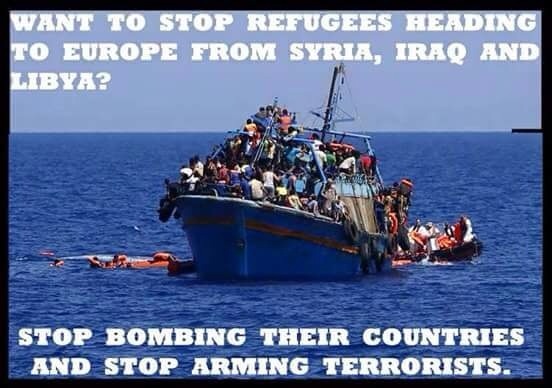 You’re bombing the wrong terrorists! 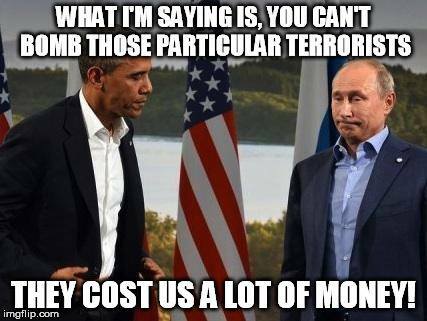 When you said you were going to bomb the terrorists, we didn’t think you were serious! So now, the message Russia is getting from Washington is: stop bombing the Nusra branch of al Qaeda and bomb the ISIS branch of al Qaeda! But since they all work together to overthrow President Assad, they are all on the same side and completely indistinguishable from each other. The US government and military-industrial complex are furious at Vladimir Putin for coming to the UNGA in New York and trolling everyone by offering to help America in the fight against ISIS, because the sad truth is, America has not been fighting ISIS – they have, along with Turkey and Saudi Arabia, been trying to remove Assad from power at all costs. Putin (displaying the skills of both master statesman and expert troll) called everyone on this bluff and left the “international community” with a question which will echo down through the years as the iconic quote of the age of the War on Terror: DO YOU REALIZE WHAT YOU’VE DONE? So let the next round of hysterical Russia-bashing begin! Russia launched airstrikes in Syria on Wednesday, catching U.S. and Western officials off guard and drawing new condemnation as evidence suggested Moscow wasn’t targeting extremist group Islamic State, but rather other opponents of Bashar al-Assad’s regime. One of the airstrikes hit an area primarily held by rebels backed by the Central Intelligence Agency and allied spy services, U.S. officials said, catapulting the Syrian crisis to a new level of danger and uncertainty. Moscow’s entry means the world’s most powerful militaries—including the U.S., Britain and France—now are flying uncoordinated combat missions, heightening the risk of conflict in the skies over Syria. U.S. Defense Secretary Ash Carter said Russia’s approach to the Syrian war—defending Mr. Assad while ostensibly targeting extremists—was tantamount to “pouring gasoline on the fire.” “I have been dealing with them for a long time. And this is not the kind of behavior that we should expect professionally from the Russian military,” Mr. Carter said at a Pentagon news conference. Secretary of State John Kerry met with Russian Foreign Minister Sergei Lavrov and said he raised U.S. concerns about attacks that target regime opponents other than Islamic State, also known as ISIS or ISIL. In Syria’s multi-sided war, Mr. Assad’s military—aided by Iran and the Lebanese Shiite group Hezbollah—is fighting both Islamic State and opposition rebel groups, some of which are supported by the U.S. and its allies. Wow! 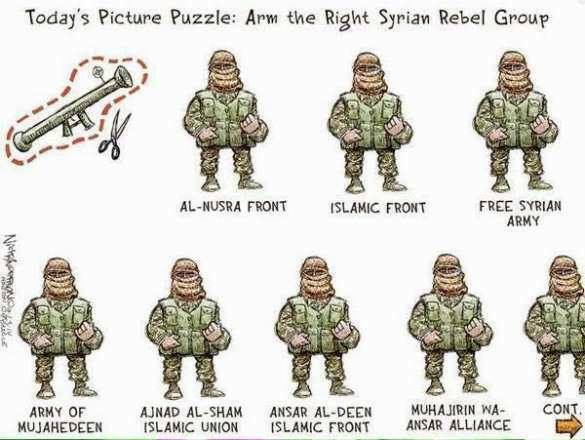 CIA-backed rebels? I thought that was a conspiracy theory! Don’t expect a lot of thanks from the US, Russia, but maybe the Europeans will at least give you a tip of the hat for doing something constructive to address the refugee crisis! 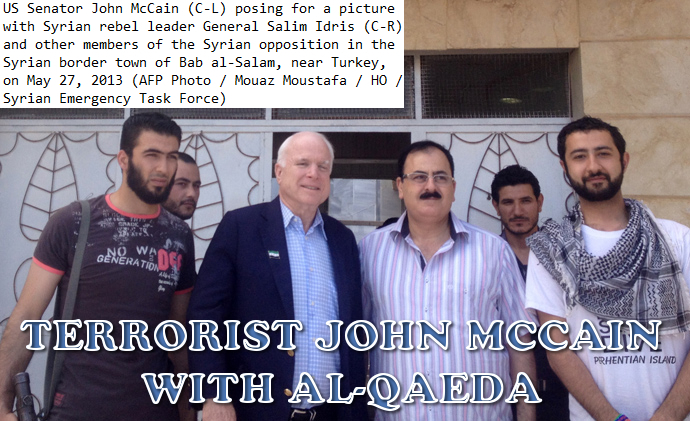 Webster G. Tarpley: After a year of phony war vs ISIS, US whines that Russia is hitting al Qaeda-Nusra, not al Qaeda-ISIS. Now that Russia has officially begun conducting airstrikes on anti-regime forces operating in Syria, commentators, pundits, and analysts around the world will be keen to compare and contrast the results of Moscow’s efforts with the year-old US-led air campaign against ISIS targets in Syria and Iraq. 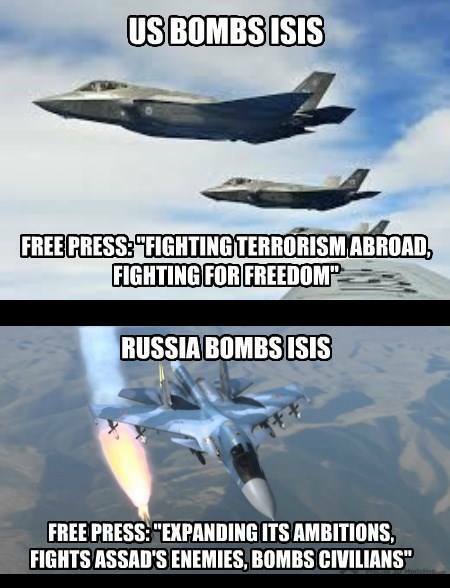 Clearly, Russia has a very real incentive to ensure that its airstrikes are effective. Preserving the global balance of power means preserving the Assad regime and, by extension, ensuring that Iran maintains its regional influence. On the other hand, the US and its regional allies actually have an incentive to ensure that their airstrikes are minimally effective. That is, for the US, Saudi Arabia, and Qatar, the idea is not to kill Frankenstein, but rather to ensure that he doesn’t escape the lab. Kerry and Lavrov both know what’s really going on here: the U.S. has numerous assets among the terrorist groups, it doesn’t really want them defeated, but it must make a show of it in order to keep up the public pretense of wanting to fight terrorism. Perhaps Russia is even giving the U.S. and its allies a chance to remove key assets from within their mercenary groups operating in Syria. There’s not much else they can do, having been cornered by Russia’s quick action. And, what? 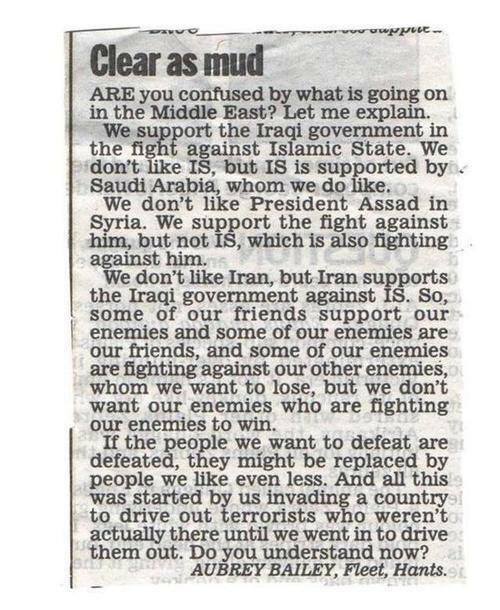 No mention of Assad resigning? Whodathunkit! Kerry basically admitted defeat, and Lavrov didn’t even gloat. After being caught with their pants down, the U.S.’s options are rather limited at this point in time in response to Russia. But they’re really trying their best, making two basic claims via the media: 1) Russia isn’t really targeting ISIS, 2) Russia is killing civilians. For example, yesterday the Wall Street Journal reported that at least one airstrike targeted U.S.-trained and -supported rebels. Vladimir Putin: The only real way to fight international terrorism is to take the initiative and fight and destroy the terrorists in the territory they have already captured rather than waiting for them to arrive on our soil. Russia is being blamed for targeting a terrorist entity which is not only on the UN Security Council blacklist but which has ties to the Islamic State (ISIS). Max Abrahms: The Pentagon suspended the train & equip program because we couldn’t find moderates. But now we’re told moderates abound & are under attack. 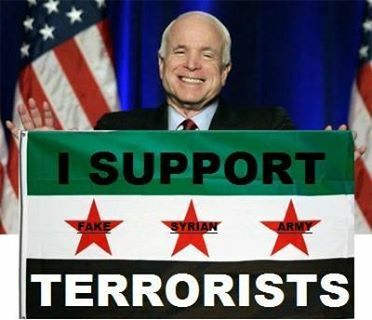 McCain: Arm Syrian rebels to shoot down Russian planes. 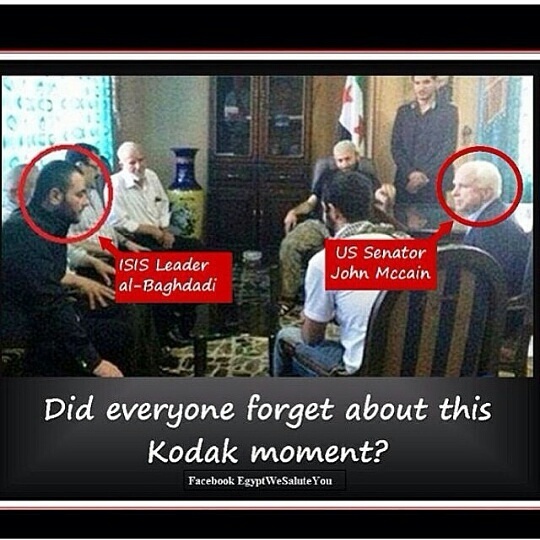 There is no difference between McCain’s “moderate” terrorist friends and ISIS – none! 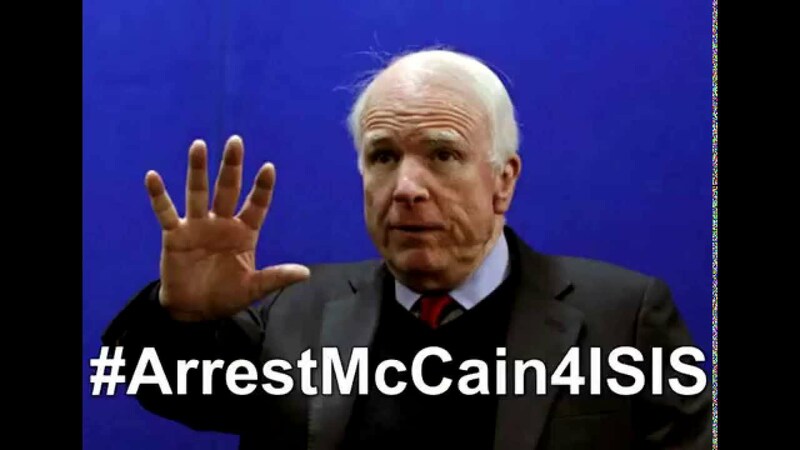 McCain is very much part of the problem. 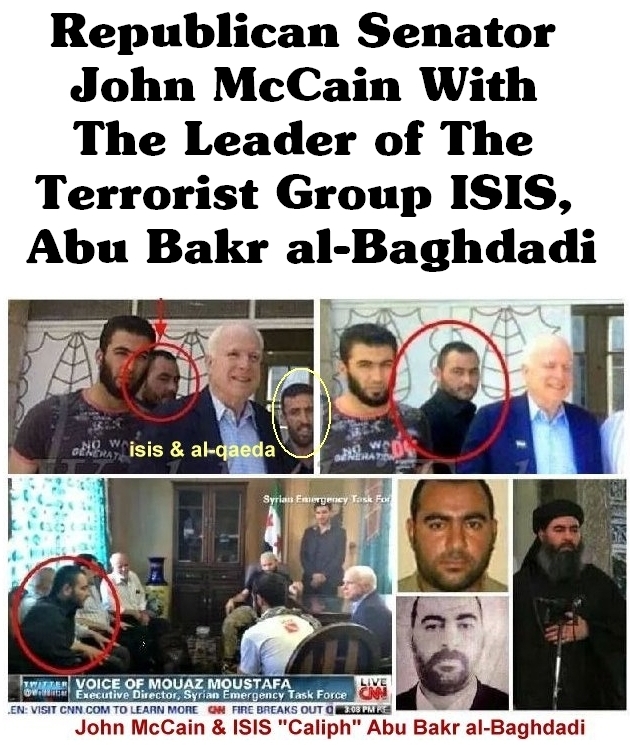 This is why Russia has to clean this mess up, because after the US enables ISIS to take over Syria, they will be in Russia! 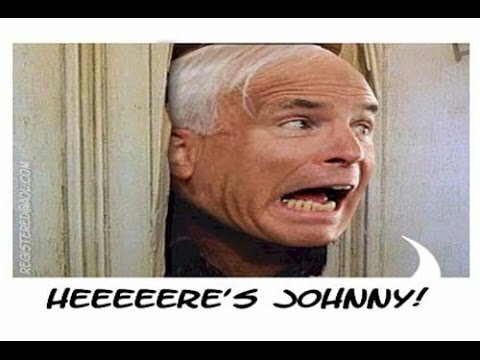 Thank God McCain is not President! And thank God for Russia! 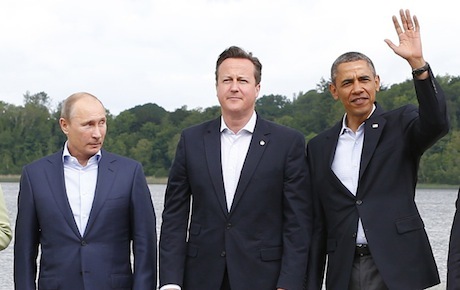 Peter Lavelle: Finally we are witnessing the first steps beyond the post-Cold War order – and praise God for this! 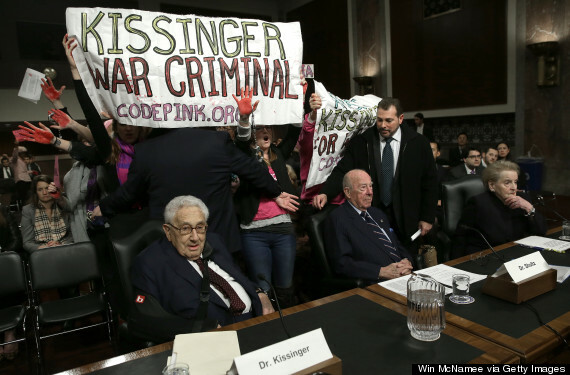 For the last two decades Washington has been sloppy and arrogant in its foreign policy all over the world. It has acted like a criminal – like when the police are on strike or non-existent. The Syrian civil war (encouraged by the west) and the migrant/refugee crisis intentionally or unintentionally created by the west are clear examples of this. 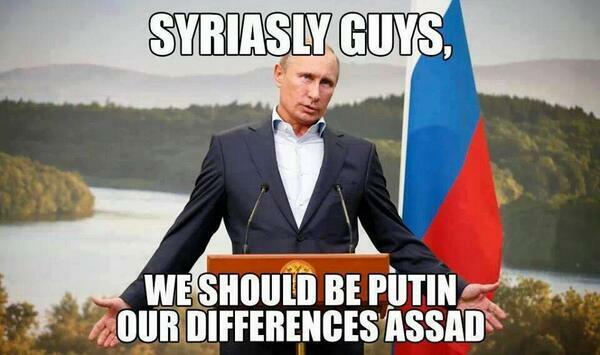 Russia’s enhanced intervention in Syria (at the invitation of the Damascus government) is a game changer. 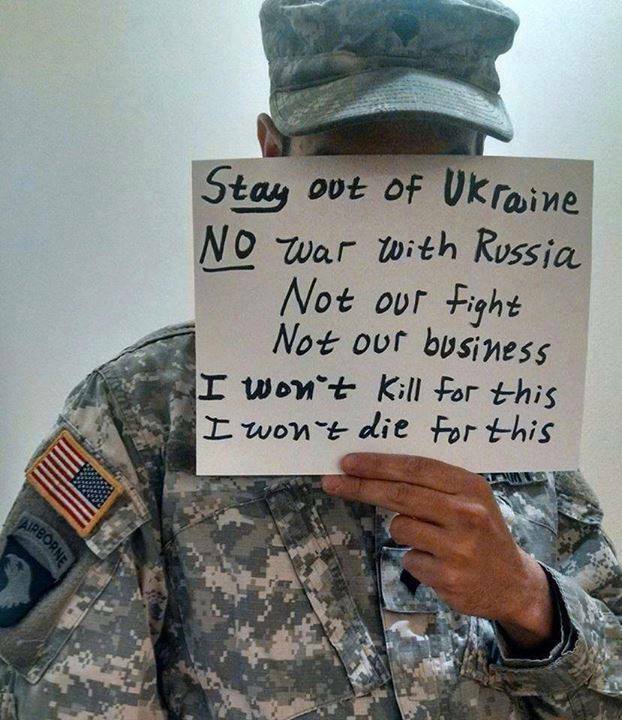 Washington and its minions need to stop playing God and return to environment of diplomacy and negotiations. 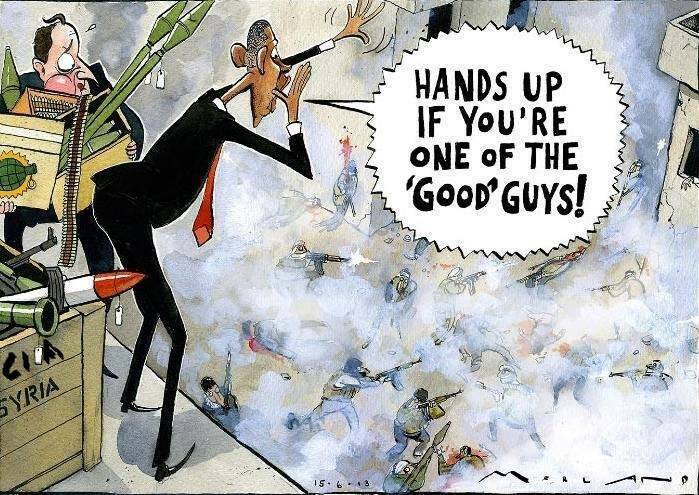 This entry was posted in Uncategorized and tagged airstrikes, Anders Fogh Rasmussen, anti-war, Assad, brzezinski, chemical weapons, CIA, civil rights, color revolution, Congress, conspiracy, coup, do you realize what you've done, doublespeak, eu, false flag, Fox News, George Bush, International Community, ISIL, ISIS, Islamic State, John Kerry, McCain, moderate opposition, Nusra, Obama, Putin, rebels, regime change, Russia, Soros, Syria, Tarpley, terrorists, the brzezinski plan, UN, UNGA, united nations, White Helmets on October 1, 2015 by bperet. 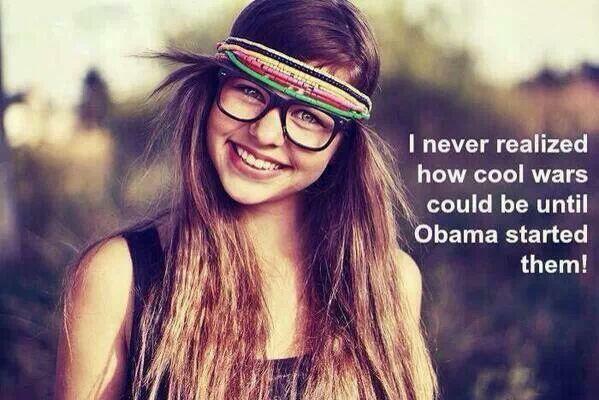 Whatever Happened to the Anti-War Left? I know that people have been getting out into the streets to protest another insane war, this time in Syria, and I’ve heard some strong rhetoric against war from the likes of well-known left-wingers like, uh… Pat Buchanan and Rand Paul? Well, yeah… may you live in interesting times! I wonder what’s up with the anti-war Left. Could they be short of cash? The President is a Democrat and he won a Peace Prize so you think it’s a humanitarian / philanthropic / spreading peace and democracy mission. Well? Of course it is. You are still so mesmerized by Obama that you would literally buy the exact story Bush and Rumsfeld tried to cram down your throats because you cannot bring yourselves to believe that this is exactly what’s happened. Obama could copy and paste practically anything Bush ever said, have the grammar and vocabulary corrected, and read it in his best Mussolini pose to thunderous applause, and you know it’s true! I know it’s true, because I’m watching it happen! You would never buy into Bush’s “spreading democracy” and “surge” but you have gleefully bought into the “limited operations,” and “kinetic military action” of Barrack Obama because you are precisely THAT gullible. Because you either believe or don’t really pay much attention to Obama’s miserably lame excuses like “no boots on the ground.” Of course! 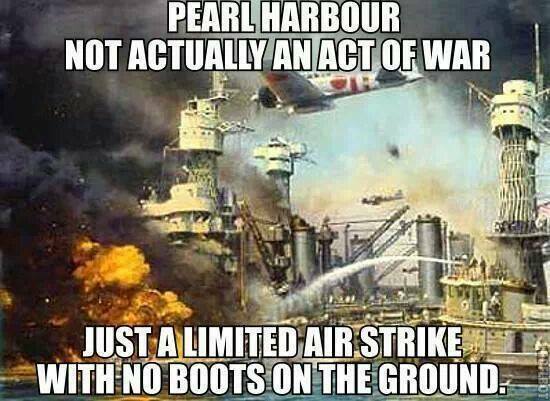 It’s not a war if there aren’t any boots on the ground. Did you really buy that without reading the fine print or did you just miss it? Boots? Seriously? 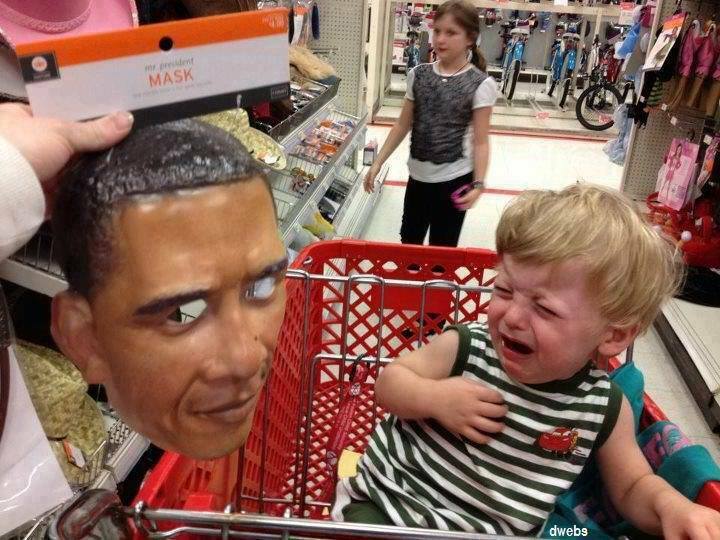 That’s the level of propaganda necessary to sucker you into selling your souls to His Satanic Majesty? So Hope and Change has come to America in the form of footwear. Maybe the troops will wear sandals instead of boots. We’ll dress them up like Jesus this time and it’ll be really cool and kinetic and peace-prizey. Maybe it’ll be Kobe’s new sneakers? Way to hold the President’s feet to the fire! What’s even harder to imagine is a Democrat agreeing with the people who have been way out in front on this issue, like Rand and Pat and many other conservatives and libertarians. 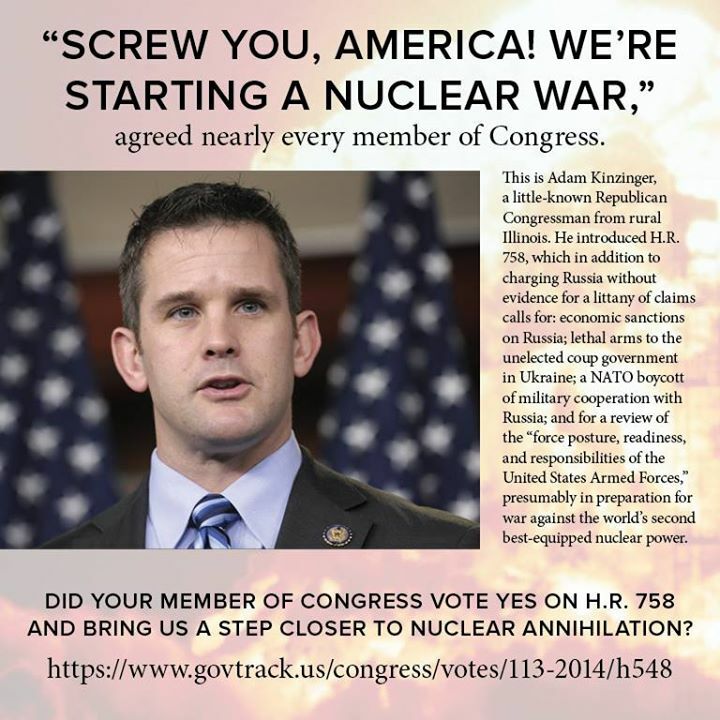 They’re screaming the loudest against war, while the other side struggles to muster a whine. This entry was posted in Uncategorized and tagged anti-war, Assad, kinetic, leftist, Obama, peace, philanthropy, prize, Syria on September 3, 2013 by bperet.